This image, sent in by NBC 7 San Diego user Alex Machuca, shows the patrol car in a residents yard. 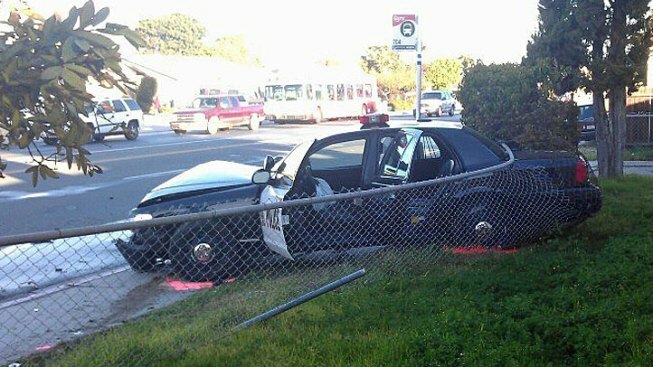 A Chula Vista police officer was injured when a patrol car collided with another vehicle and landed in a resident’s yard early Wednesday. The collision happened at 4th and Moss at 5 a.m. The officer was going northbound on 4th transporting a prisoner to the jail. As the patrol car crossed Moss, it collided with a vehicle heading eastbound on Moss. Chula Vista Capt. Gary Wedge told NBC 7 San Diego the details on how the collision happened are still unknown. The officer involved was sore and bruised but was expected to be released from the hospital with non-life-threatening injuries Wedge said. The prisoner was taken to a different hospital Wedge said. The driver of the other vehicle was transported to Scripps Chula Vista Hospital with complaints of pain.